The Good News is Idaho continues to get a gift that keeps on giving--SNOW! 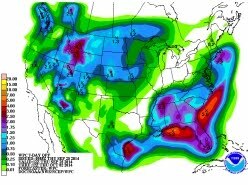 The Bad News is that Arizona comes up short...and D-R-Y once again in this 7-day QPF graphic above. Dust another day. Which came first, the Chicken? The Egg? Or The Egg Processor? We've been doing a lot of study on various esoteric backpacking stuff. Some of you may know we've spent a lot of time researching various egg powders. Finally, as we are wont to do, we actually began studying how egg powders are made. Is this necessary to go on a two-night backpack trip in the Grand Canyon? Of course not, Dear Reader--it is just us being us...Curious Johnny and all that stuff. Well, if you've ever wondered how the magic of the chicken gets converted into powder that pleases people, wonder no more. 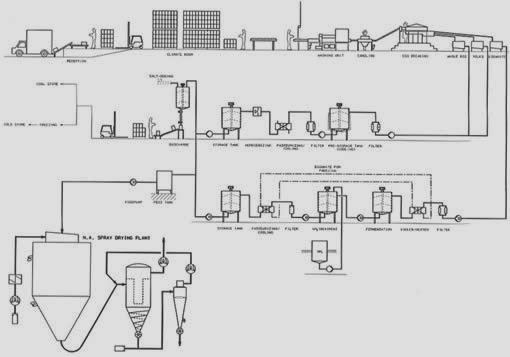 Here is the spray dry process described in more detail that anyone would ever hope to know. Speaking of dust, there's a major Dust Up happening along the fabled Santa Fe Railroad line. Of course it's no longer run by the Santa Fe but that's how we all remember it. The photo above is from a movie about The Harvey Girls and is kinda reminiscent of the mind set several small-virtually-unheard-of-Southwest Communities feel about "their" railroad. The article explains it all in more or less articulate fashion. 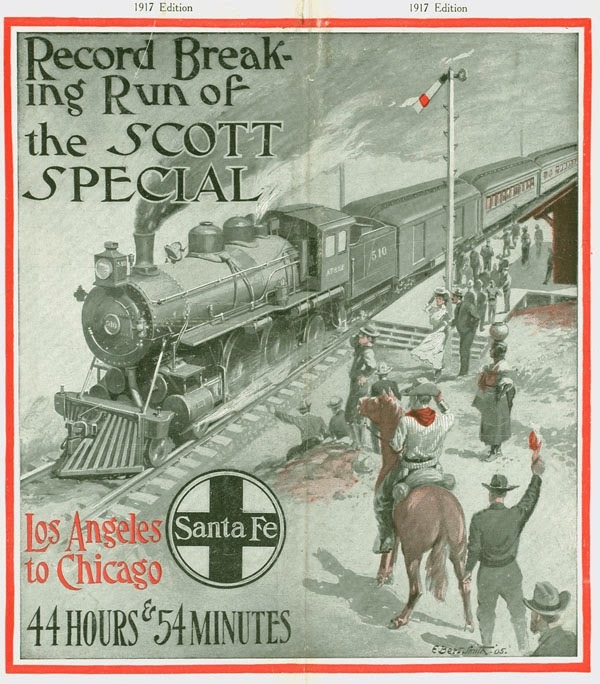 And so, naturally, after we read the article above we started once again ridin' our own rails through the Cyber System and got captivated by Death Valley Scotty's famous high speed run in 1903. We studied this run in great detail about 30 years ago and had forgotten about it. If you are a rail fan, you will enjoy it. Note that their high speed in 1903 is pretty much the average speed of a passenger train in this day and age. Yeah, it's a 2011 poster but the events & times are the same. 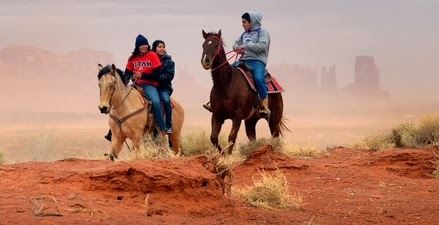 The Verde Valley's Native Americans have quite a story as all Natives do. They lived here forever until white people showed up and took their land by force. Our local Natives didn't go down without a helluva fight. In fact, they fought three years longer than WWII, resisting for a total of 7 years (1865-1872). The winner, General Crook, gave them a reservation that would include most of the whole Valley and bought supplies for his troops at the fort. Jealous interests elsewhere got the treaty rescinded and the military somehow decided to round up all the local Natives and force march them to the 19th Century equivalent of a concentration camp almost 200 miles away. 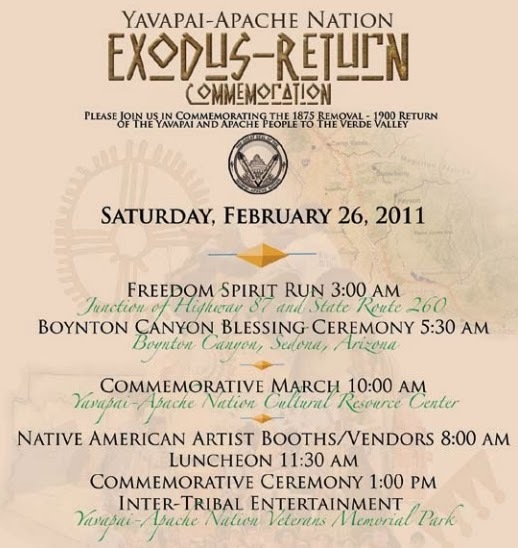 Today's Yavapai-Apache Nation will once again commemorate that terrible time with the Nation's annual "Exodus" events Saturday. The young and fit run a 50 mile relay race. There's a community march, a Beauty Pageant and much more. Here's some info from the Nation's Cultural office. A pretty big chunk of The Navajo Nation is actually located in Utah, specifically San Juan County. Here's a great article about the current state of education in that Neck of the Nation. and is shown in relationship to the larger Y-stone caldera. The Island Park Caldera is one of our favorite Play Places. Here's a couple of articles from today's Idaho Falls Post-Register. They are both Copyright 2014 and used with permission. The first is self explanatory and will be of interest to anyone who knows and loves this land. ASHTON -- The Island Park area of northern Fremont County is unique. 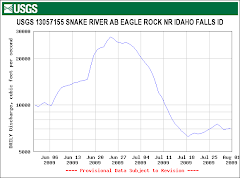 Its spring-fed streams provide anglers the joy of fish pursuit, and those streams also provide a dependable share of the water supply for downstream irrigators. Additionally, Island Park is a snowmobile and winter sport destination, as well as a summer mainstay for boaters, campers, mountain bikers and other outdoor enthusiasts. It also has historic and geographic significance -- the Trail of Tears of the Nez Perce passes through it, as well as the Continental Divide. "Where the Nation Vacations" has been its motto. Island Park's fans -- from ranchers to recreationists -- turned up Tuesday in Ashton ready to ask questions and offer opinions at the kickoff of a study on the future of Island Park. The meeting also included presentations defining the unique geological and related hydrological features of the Island Park area. Talk of creating a national monument is sparking interest in and around Island Park, as well as across the region. In the 1990s, again in the waning hours of the George W. Bush administration and also last year, the Island Park area was mentioned for possible designation as a national monument. The Henry's Fork Watershed Council's goal is to get as much local comment as possible into the study on Island Park's future. One after another, speakers talked about the need for public participation in determining the area's future -- even if the national monument designation never happens. 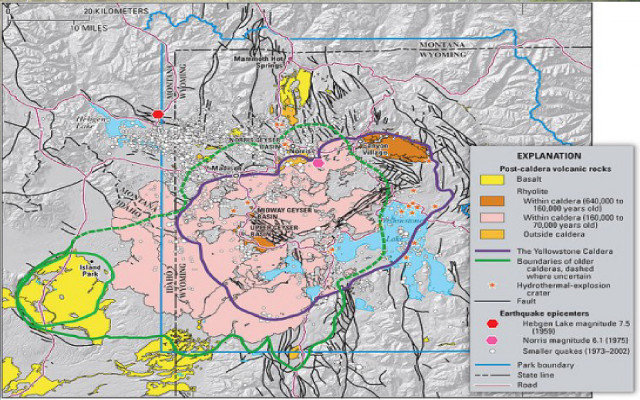 Fremont County commissioned the study, folding it into a larger, federally funded study to develop a "regional plan for sustainable development." The county hired Jan Brown as special projects manager to oversee the study and asked the Watershed Council to provide the forum and distribute information. Many of the questions raised as the speakers explained perspectives and the area's history expressed concerns about the motivations behind the study. "What are the threats?" asked Steve Pinther, a contractor who noticed speakers frequently talked about the need to protect the area but discussed no specific threats. Identifying potential threats to Island Park is one of the aspects of the study, said Steve Woodruff of the National Wildlife Federation. The federation is providing matching funds for the study. "The threat is if we don't seize this opportunity," Woodruff said. Under the federal Antiquities Act, presidents have the power to proclaim national monuments with or without public comment and approval. Jim Caswell, who under the Bush administration helped craft a list of possible national monument sites, including Island Park, said he is not aware of any push today in Washington to designate an Island Park Monument. But he and other speakers indicated that could change. "It's not some hidden agenda of the Obama administration right now," Caswell said. Now, as you know, we don't normally put any law enforcement-related stuff into our Morning Edition. However, we find this story fascinating. As chance would have it, Idaho Falls stages a "Community Night Out" each year. All the public safety agencies come to display some of their equipment. The Bomb Squad always shows up. I love talking with those Bomb Squad guys. (It's all male.) They are open, honest, fun and don't take themselves seriously. They love to show off their equipment and talk about what they do and tell stories about hair-raising bombs and so forth. Due to the way the world works, their coverage area is roughly TWENTY THOUSAND SQUARE MILES! And so, now that I know they have this new toy, Man, I can tell ya right where I'm gonna be when this summer's Community Night Out gets underway along the Greenbelt! I wanna know a lot more about this puppy's specifications and capabilities. Way to GO, Idaho Falls! The Idaho Falls Regional Bomb Squad on Tuesday unveiled a new armored vehicle to serve eastern Idaho, as well as parts of Montana and Wyoming. 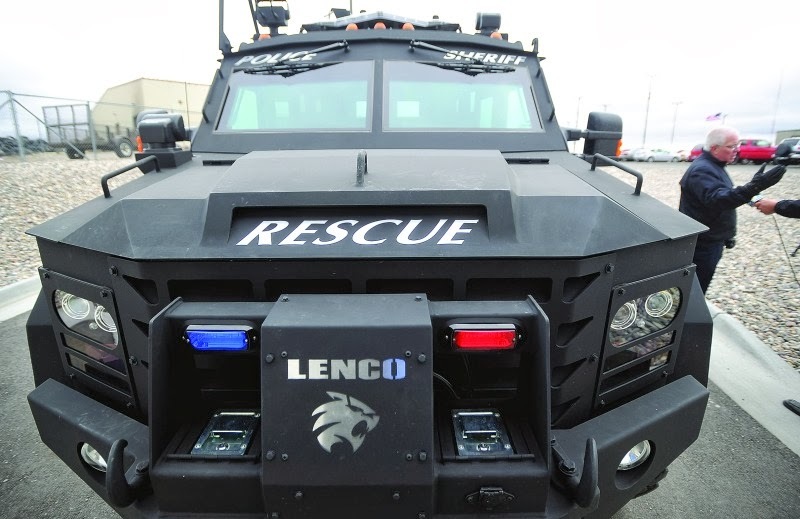 Bonneville County contributed $40,000 toward the $336,000 cost of the 2013 Lenco BearCat. The federal Department of Homeland Security paid the balance, Sheriff's Capt. Sam Hulse said. The BearCat, in addition to responding to bomb threats, will be used by SWAT to aid the Bonneville County Sheriff's Office and Idaho Falls Police Department. Sheriff Paul Wilde said the vehicle is needed to keep officers safe while responding to calls involving suspects with deadly weapons. "It's not one of those things that we're going to use out there and just tear things up," Wilde said. "With the more severe incidents that have been coming up with firearms and those kinds of things, this is a protection vehicle that we can use to make sure the officers are safe." The BearCat, which seats 10, is equipped with bullet-resistant windows, an inside-air source, a gas-injector unit for deploying tear gas, a radiation detector and a mount for a bomb-disposal robot. It provides law enforcement with protection that previously wasn't available, Hulse said. "The truth is in the community, multiple times a year we could have an incident that this truck would be very valuable to help defend and protect the citizens and law enforcement," Hulse said. Bomb Squad Detective John Marley said the regional bomb squad averages 20 to 40 bomb reports a year. Before acquiring the BearCat, bomb squad members would have to carry 40 to 50 pounds of equipment to a location with only an hour of oxygen in their suits. Marley said the vehicle's on-air system will allow officers to get closer to bombs before detonation. "It will be more efficient and a lot safer for the personnel involved," Marley said. "Just being able to carry the equipment in there instead of having to carry it down with the bomb suit is a big benefit for us." "The goal is always life-saving, both for us and for the suspect or violator at the time," he said. "This provides us with opportunities that we wouldn't have otherwise to possibly bring that to a safe resolution."